In 2016 we’ve been working on a number of projects that have involved developing a Theory of Change, including our evaluation of Kent County Council’s Mental Wellbeing Programme, SLaM’s Recovery College, the arts-based intervention ‘Performing Places’, and the SLaM Mental Health Promotion Team’s ‘Wheel of Wellbeing’. The purpose of a Theory of Change is to establish a clear model for a programme or intervention, identifying the links between the rationale for setting it up, its implementation and its outcomes. It usually takes the form of a diagram, which is accompanied by a written narrative. A Theory of Change helps a programme clearly articulate its aims and how it intends to achieve these, serves as a decision-making tool for programme activity, and can inform the detail of a subsequent evaluation by making links between activities and outcomes explicit, thus allowing for these to be tracked over time. In late summer we began a new project for Macmillan Cancer Support, helping their Inclusion Team to co-produce a Theory of Change for their Mental Health and Cancer Taskforce. The Taskforce is an initiative that brings together people affected by cancer and mental health or emotional wellbeing problems, their carers, and professionals and other stakeholders, to find ways to improve outcomes for people with this dual lived experience. However, its initial remit was very broad, as the Inclusion Team wanted to ensure that the specific aims and activity areas were decided on collectively and collaboratively with Taskforce members, and thus commissioned McPin to develop the Theory of Change. So what did we do? We first carried out interviews drawing on expertise from experience, with members of the Patient and Carer Reference Group who helped to steer the Taskforce. An initial draft of the Theory of Change was developed on the basis of these interviews, and was presented back to this group at a workshop which generated much discussion. A subsequent draft was then presented to professionals working in the field of cancer and mental health and was further refined. Lastly all research participants were invited to feed back on it one final time. The Theory of Change and the accompanying narrative has been well-received by the Taskforce and Macmillan’s Inclusion Team, who will be using it in the coming year to help plan and guide their programme of activity moving forward. We have enjoyed delivering this work and have learnt a great deal. Theory of Change is a useful framework to engage in using a co-production approach, although reaching a consensus can be challenging. Our solution was to understand the differences in opinion and attempt to make sure diverse voices were heard and represented in the final model. The end of 2016 marks the end of our mixed methods evaluation of Kent County Council’s (KCC) Mental Wellbeing Programme, on which we have been working since November 2014. 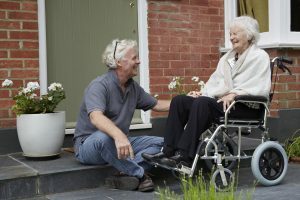 The public health team at Kent County Council commissioned a series of projects and services to improve wellbeing amongst the local population – some were targeted at specific vulnerable groups, such as people with moderate mental health problems, people at risk of isolation, young people, and professionals working in a range of roles – and others at the general public. The Programme was one of the first of its kind among local authorities to put the promotion of positive mental health and the prevention of mental illness and at its core. It was unusual in terms of both the level of investment in service provision, but also in evaluation. The commissioners were keen to learn how well the programmes had achieved the goal of improving wellbeing. Measurement is important in mental health, and often we are drawn to standardised assessment instruments. The Kent programme used the Warwick-Edinburgh Mental Wellbeing Scale (WEMWBS) as a key measure across a number of their projects. We have also used this in other projects, and like many research measures, it is imperfect. In Kent, we demonstrated the positive impact the interventions were having on wellbeing through the increase in WEMWBS scores. These findings were reinforced with qualitative insights, based on interview and observational data, into the mechanisms that bring about improvements for people participating in the projects. We found this combination of approaches very valuable in drawing conclusions and helping to explain how results may have been achieved. The Kent Mental Wellbeing Programme was found to improve personal wellbeing for individuals, and also achieve community level change. It was an innovative and experimental ‘pilot’ in public mental health commissioning, with the diversity and the flexibility of the individual projects commissioned crucial to the success of the Programme as a whole. The robustness of the evaluation has led to a number of the projects being recommissioned by KCC over the long-term, and to securing additional funding. We really enjoyed working on it and meeting the committed and inspiring people delivering the projects. 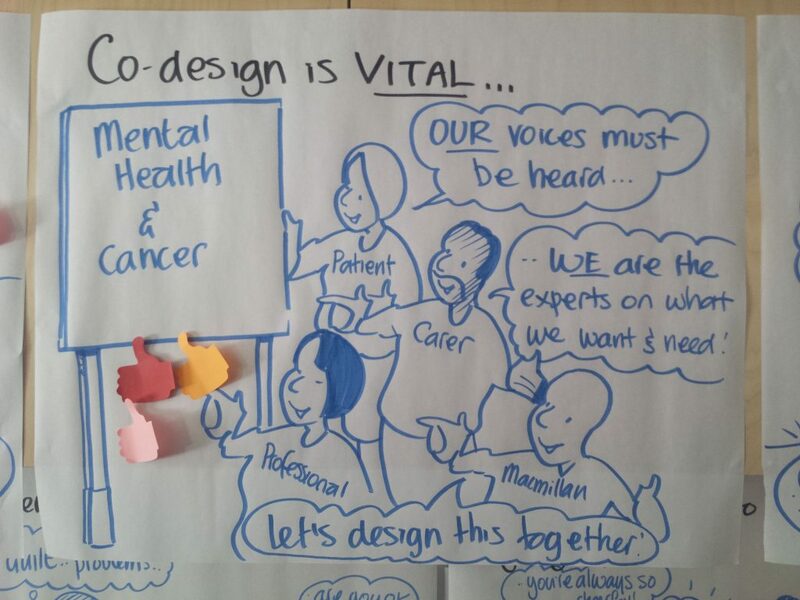 This year, we have been busy developing our work on coproduction – an approach that brings people with different expertise together to co-design solutions. McPin have been involved in setting up a working group, including people with lived experience of mental health problems, clinicians and academics for the Community Navigator Study, which we are working on in partnership with University College London. Due to how successfully the working group provided input to the study, its remit expanded, with members of the working group with lived experience sitting on the interview panel for the Community Navigator roles and helping to co-deliver some of the training for Community Navigators. Not only did this give people additional opportunities to shape the study, but it also allowed the opportunity for personal development. There are, of course, still ways that we can improve how we do co-production. For instance, we received feedback from working group members that more needed to be done to ensure that information is accessible. This means providing clear explanations of terms used and avoiding jargon altogether where possible, as well as giving people time to process the information. Saying this, feedback was generally very positive and demonstrated the benefits of meaningful coproduction. In 2017, we aim to further develop the ways that we do coproduction and our understanding of what it means to do coproduction well. One of the areas that we have already identified is how to increase the diversity of participation in co-produced research. 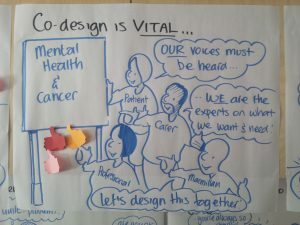 The discussions we had at our first methods workshop – integrating lived experience expertise into mental health research teams – were very informative and will help us with this goal.